After years of being in this industry, I have seen a lot. Changes, improvements, trends and scary little secrets that still tend to shock me even though I should be numb to it by now. Though I have never read a book or taken any classes on social media marketing, I sure have done a lot of it as an individual, then an agency and now as a brand. I have decided to create a list of 50 things I have learned about the industry. They are in no particular order and by no means is this a complete list. Just some things I decided to jot down that I believe might be helpful for our readers. I think you will find there is something directed to the beginner, all the way to the industry professional. Some are simple truths you may already realize and others are opinions I have formed through thousands of conversations and connections over the years. 1) Social Media is a marathon, not a sprint. 2) You will make mistakes. Embrace them and move forward. 3) Consistency is the most important thing over the long-term. 4) Curating topical content is important. 5) Relationships do result in revenue. 6) Most have no idea what they’re doing. 7) Consultants and speakers are going to kill this business. 8) Do not listen to Social Media Marketing Celebrities. 9) Social media is really hard when done right. 10) A majority of social media marketers connect and engage with their peers and competitors, not their prospects. 11) The last thing we need is another social network. 12) Helping others selflessly is rewarding in and of itself. 13) Automating anything directly to your streams is not effective. 14) Using TruTwit to force new connections to prove they’re human is a beginner epidemic. 15) Most industry apps and tools are created by people who have never successfully done social media marketing. 16) Other than keynote speakers, many travel to and speak at events at their own cost/expense to pretend to be important. 17) Facebook leadership doesn’t have a clue what their customers really need and want. 18) The more immediate you respond to new comments, follows and engagement, the more likely you will get more. 19) Content isn’t king, getting real results is king. Content is part of the process. 20) Don’t pay attention to what industry “leaders” say, just watch what they do. 21) Quantity AND quality matter. It’s not an either or, but BOTH. 22) The proper tools are required. Too many people frequently try all the new tools as a distraction in order to avoid doing what they know they need to do. This is counterproductive. Find tools that solve your biggest problems ONLY, then execute with them. 23) Many social media “professionals” are arrogant and impatient with newbie ignorance or mistakes, instead of helpful. 24) The people in the industry that have the least experience, knowledge and skill call themselves Experts, Ninjas and Gurus. 25) Social media marketing changes weekly. 26) A proper social media strategy is required if you expect to get results. 27) Big brands are the worst at social media marketing. They don’t do it properly and they don’t have to. 28) Don’t pay attention to or try to replicate what big brands do in social media. 29) There is only one steadfast rule in social media – DO NOT SPAM! 30) People connect with people, not brands or logo’s they’ve never heard of. Humanize your brand. 31) SMB’s need to leverage personal and business social accounts to be most effective. 32) Most SMB’s should stop spending time and resources to learn from “experts” and hire a qualified social media agency. 33) Your mobile device must be deployed in real-time with your social accounts if you want to be successful. 34) Google Plus is NOT a replacement for Facebook, nor will it “kill” Facebook. 35) If you are holding or attending more than 2 Google Hangouts on air “shows” per week, you may need to evaluate your bank account, time management and priorities. 36) Most social media “consultants” are broke. 37) Most social media marketers don’t post frequently enough. 38) A blog is not required for every business. Content creation is required for every business. 39) Only retweeting or sharing other people’s status updates isn’t a strategy. 40) Posting quotes everyday isn’t a strategy. 41) Most marketers have not spent the time to clearly define their target audience and what drives them on social media. 42) The only place that “If you build, it they will come” works is in Hollywood. 44) Effective social media marketers don’t take nights and weekends off from engagement. 45) Social media is the center of online digital marketing efforts. Integrate it into everything you do on and offline. 46) Proper social media marketing that gets real results, cannot be hired for $50/mo. 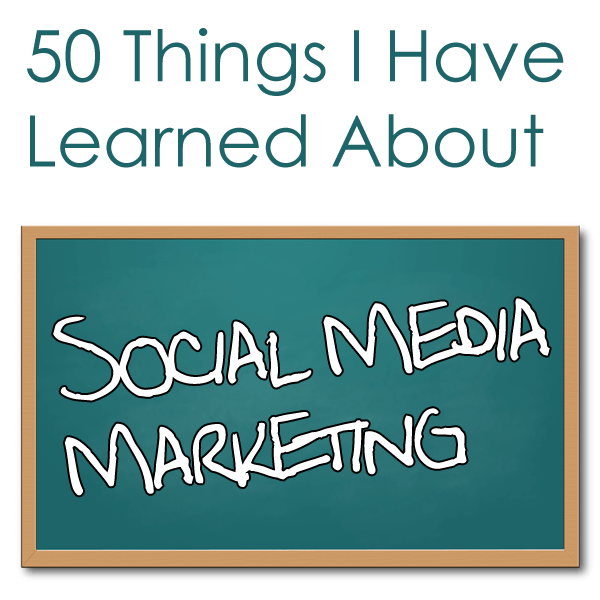 47) There are a ton of classes and content about how to do social media marketing. Be careful what you read. 48) Most social media agencies are solopreneurs that are great at social media marketing, but need help at making it a profitable business. 49) Social media is like a parallel universe to the real world. What you would never do at a networking event, you should not do in social media. 50) Analysis paralysis will stifle your social media results. Do more, analyze as needed. Again, this is not a complete list of what I have learned, just a random compilation that crosses all aspects of the industry. What have you learned? Whay thank you Lauri. I hope it was helpful too! I always appreciate your insights Robert. Thank you for taking the time to put this together, tons of value here. I’m going to do my part to help get eyes on it. God knows there are those that need to see this. All the best. How many times did I go down this list saying, yes, and yes, and oh hell yes! Maybe one day I will actually find the time to actually make an attempt to tackle this thing called social media, but until then, free coffee at McDonald’s this week! Thanks for sharing! hahahaha I’m all in of it has to do with coffee Sheenika. Thanx for jumping in on this! Reblogged this on Online PR UK. Great list here definitely bookmarking this! My hope is YOU got a lot out of it for real my friend. Just what I need to read today. Was about to throw in the towel as learning and doing social media on a few platforms is ‘killin’ me. Ok. I read your list, said yes, yes, thats right and I wont give up or in. Just try to be smarter, less exhausting. so glad you enjoyed it Kaarina. Yes, real results do matter and are obtainable if you have a proper strategy and do the real work required. Thanx for sharing on Twitter also. I love this, Robert! Thank you. I quoted a few of the ones that resonated with me in a blog post and added a couple of my own too. This is invaluable to people who do what we do, who are thinking about doing what we do and for clients/brand managers/in-house social media marketers! Thank you again. So glad you liked it Megan! Would love to see your post as well. Hi Robert! Seriously, so inspirational and I could relate to every one of these! My blog is http://untappedmediaco.com/blog and it’s the most recent post. Cheers!! Yes. Now I can sleep better. Truly, every single point up there is true. Nobody really knows what they are doing. Amen. Terrific list, excellent insight. Thanks! Robert, always from the hip. Love it. Hope all is well. Hi. I enjoyed reading this post and I’d love to translate it into Spanish and share it on our blog (mentioning it’s a translation and linking here, of course). May I do it? Yes you may Jose, as long as you credit and link to the original.